I am happy to, as requested, retract the information that this is the same person who is the president of the AHHA. This apparently is just another BYB with the same name who has the disturbing idea that horses hurt themselves for attention and is excited about the prospect of breeding to a HYPP N/H horse and lets her kid ride with no tack and no helmet. So, of course, all of my opinions about her still stand, as do all of my opinions about the American Halter Horse Association. If the AHHA's attorney would like to sue me, that is just fine as it will be a GREAT case to get attention for the very important issue of the need to BAN all breeding of HYPP H/H and N/H horses! So please feel free to do so. I am merely stating my opinions and have every right in the world to do so. "Tais has been doing a lot of babysitting lately since he hurt himself. Tais is notorious for getting his feet in the fence because he knows he will get pain med's and a lot of attention. Have you ever met a horse junkie?" "In Jan. 2004 Tais got his hoof in the fence and cut it to the bone (scraping it!). I was very cautious at how much pain medicine he was to receive because he did this for attention. " "Sid has been SOLD & has left the U.S for Caracas, Venezuela!!! See ablo espanol?" "On June 13th we bought a new filly and I was kicked in the liver by her when we were bringing her home. I know - I shouldn't have walked up behind her or touched her. I was trying to help guide her out of the trailer so she wouldn't get more stressed out but, she had other plans in mind!" "We plan to add Sir Cool Skip to the list of stallions that she will be bred to after she has had her first foal." "As you can see in the photos of Scottie he has a bandage on his right leg. He had a mishap with the fence and got a few stitches. I guess it doesn't pay to be hot dogging when momma doesn't want you to." FHOTD in: What the heck do you have for fence??? They're not doing this on the panels in your pictures. She is a Mother of the Year candidate as well! Nope, you're not seeing things. 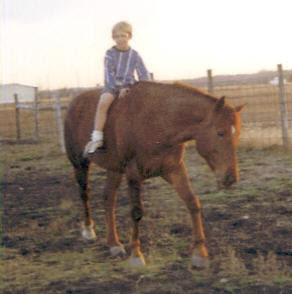 There's not even a piece of baling twine on that mare, and of course no helmet on the shorts-wearing child. Feel free to discuss. You ALL know by now what I am thinking!